We are nearing the end of the 21st year of free summer concerts at the Chittenden Locks! 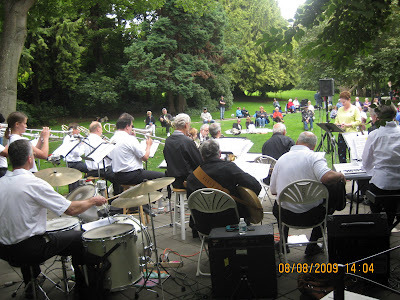 Beginning in June and continuing through Labor Day, the concerts attracted thousands of listeners to the Locks to hear a wide variety of music- jazz to gospel, salsa to bagpipes-- along with flower shows and an antique car exhibit. Bicyclists stop to listen, couples dance on the grass, kids clap hands; everyone enjoys the music in the beautiful setting of the gardens. Catch the last concert of the season tomorrow at the Locks! Folding chairs are available at 1:30 p.m. (first come/first served basis) and the music begins at 2:00 p.m.